Tim Olmstead (with wife Carol) sews a bag in Norwood. In his new collection called Canvas Bag Machine, Tim Olmstead has thrown himself into his product in a way few designers have. 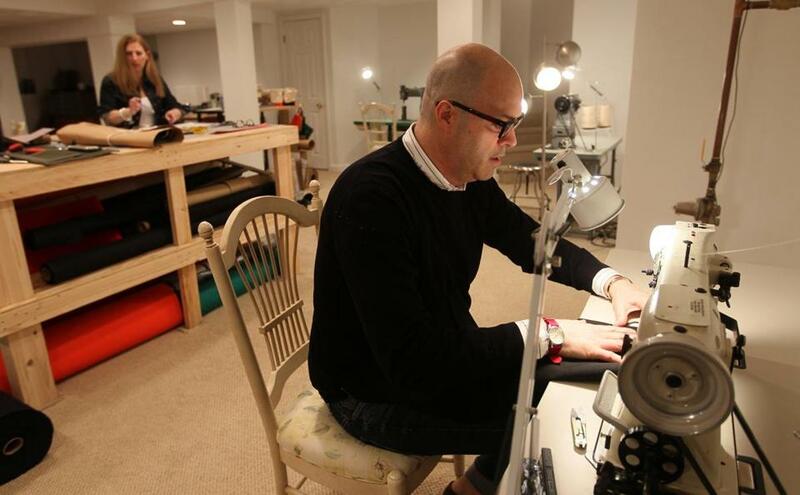 Since officially launching this month, Olmstead has been sewing every single bucket, tote, wristlet, and canteen-style bag, a labor of love that took the popular former manager of Barneys New York’s Boston flagship store into a second career resurrecting his grandmother’s livelihood. Some styles in the Canvas Bag Machine collection. The homespun brand began in the late 1950s when his grandma, Rose DeMar, began working for the now defunct Suburban Awning in Greenwich, Conn. In addition to sewing awnings, she used the scrap pieces for bags of all shapes and sizes. In the 1970s, DeMar moved to Lincolnville, Maine, where she continued to produce a variety of the bags with Olmstead’s aunt. The pair sewed all through the winters, and each summer they opened a little shop in Camden to sell the bags to tourists. 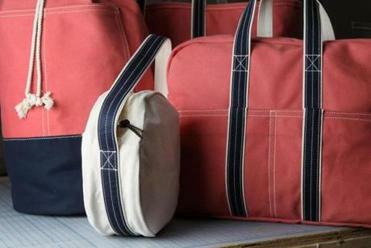 Olmstead deconstructed the original bags to create patterns for Canvas Bag Machine, and launched with eight styles. “They’re completely sensible, and you can turn them into something chic,” he said. A fashionista might label Canvas Bag Machine — with its timeless aesthetic and New England utility — as a “heritage” brand, but Olmstead cringes at the word. What he does love is the authenticity of his grandmother’s handiwork. Olmstead and his wife, who worked for years as a buyer for Filene’s Basement, thought for years about making a go of Canvas Bag Machine. Last fall, he threaded his first Singer, and with the help of a sewing teacher learned his way around several industrial machines. He can now whip up a tote called The Standard in less than an hour, and a clutch in half that time. On a rainy afternoon last week, Olmstead gave a tour of his working basement studio in Norwood. The shop features six industrial vintage sewing machines, and on the floor lay giant bolts of Nantucket red and forest green canvas. He proudly pointed out the many bag parts that come from the same family-owned companies his grandmother used. Lunder Manufacturing in Maine, for example, provides the strapping used for trim while a New Jersey company makes the cotton canvas. The leather zipper pulls on the Slip, the popular clutch, are a new modern detail for the brand, a nod to Valerie Parquette, the woman who taught Olmstead to sew. His hands-on approach has drawn the praise — and purchasing power — of many former customers from his Barneys days. Among them is Courtney Forrester, who bought a dozen Slips with her friend Simone Winston to give to guests at a recent charity event. Forrester, who owns the Sweet cupcake chain, wants to host a trunk show for Olmstead, and said the bags’ quality and uniqueness will be an easy sell. “When I visit a place, I need to take away something you can only get there. With the Web and the other manners of shopping, it’s hard and harder to find those items. This is a New England item — something you could see on Main St., in Nantucket, or on the Cape,” she said. For now, however, Canvas Bags, which retail between $36 and $248, are only available online at canvasbagmachine.com, but Olmstead said trunk shows and brick-and-mortar opportunities might be in the future.